Alexandria, VA, October 30, 2018 — SDFCU celebrated the grand opening of its new branch at Charleston FLETC at 2009 Dyess Avenue in Charleston, SC on Friday, October 26. This new location provides full-service banking products and services to the approximately 1,700 employees currently working at the facility and is open Monday through Friday from 8:30 am to 4:00 pm. 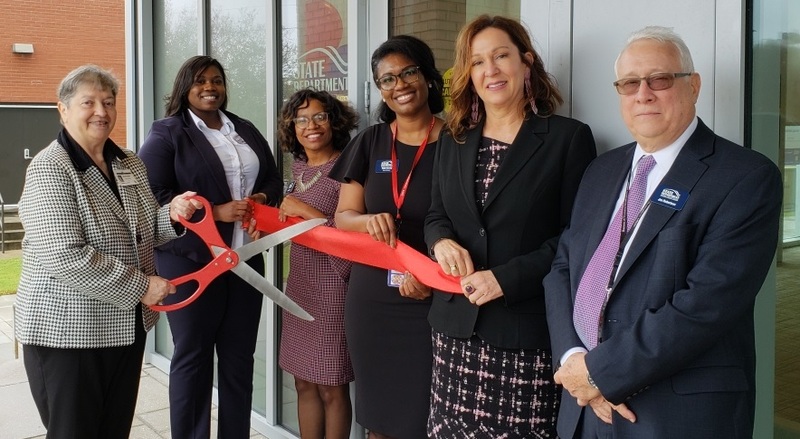 At the Grand Opening event, Marlene Schwartz, Chairman of the Board of Directors stated, "We were pleased to be given the opportunity to open a branch at this location by our sponsor, the Department of State. For years, we have been visiting the facility to provide seminars and services to our members located here. With a a branch onsite now, we can better serve the needs of existing members and introduce SDFCU to other employees at the center." The Grand Opening festivities included a ribbon-cutting ceremony at the branch as well as a meet-and-greet for attendees to speak with representatives from the SDFCU Board of Directors and staff. State Department Federal Credit Union is a member-owned full-service financial institution that is committed to serving its over 80,000 members worldwide. With over $1.9 Billion in assets, SDFCU offers a wide range of financial products and special services that address the diverse and unique needs of its members. Visit SDFCU www.sdfcu.org. SCOTTSDALE, A​riz., CU Realty Services welcomes State Department Federal Credit Union to elite Million Dollar Club. A desire to better meet the real estate and mortgage needs of a geographically diverse member base was the catalyst behind State Department Federal Credit Union’s (SDFCU) 2004 implementation of HomeAdvantage​®​. quote from KatieToday, the CU has not only helped thousands of members buy and sell their homes, but it has also delivered more than $1.1 million in HomeAdvantage Cash Rewards along the way. While hundreds of CUs and CUSOs across the U.S. offer HomeAdvantage to its members, SDFCU is one of only eight to surpass the million dollar milestone and join the program’s prestigious Million Dollar Club.The Washington, D.C.-based credit union serves a unique group of more than 73,000 members. Many—including Department of State foreign service officers, diplomats and ambassadors—live and serve outside of the U.S. Regardless of their location, SDFCU helps members navigate the search for and purchase of a U.S.-based home, often while they are still living overseas. SDFCU’s Million Dollar Club success is tied to their members’ use of the HomeAdvantage agents. “We have members purchasing homes they’ve never stepped inside. Our HomeAdvantage agents provide videos of homes and neighborhoods and will often work with the member for six months to a year before they come back to the states,” said Gillogly. State Department Federal Credit Union is a member-owned full-service financial institution that is committed to serving its over 73,000 members worldwide. With $1.7 Billion in assets, SDFCU offers a wide range of financial products and special services that address the diverse and unique needs of its members. Visit SDFCU ​www.sdfcu.org. - DULUTH, Ga. & ST. PETERSBURG, Fla.--(BUSINESS WIRE)--Digital Insight, an NCR company, and PSCU today announce new credit card management capabilities that will enable consumers to access credit card accounts alongside checking and savings accounts in online and mobile banking applications. State Department Federal Credit Union is a member-owned full-service financial institution that is committed to serving its over 67,000 members worldwide. With $1.6 Billion in assets, SDFCU offers a wide range of financial products and special services that address the diverse and unique needs of its members. Visit SDFCU www.sdfcu.org. Credit Union Times - Digital Insight and PSCU announced the roll out of a new service that provides credit card account access alongside checking and savings information in online and mobile apps. Known as Card Management Services for Digital Banking, the service gives consumers a way to manage credit card accounts via web browsers, smartphones and tablets. These new features are designed help reduce the costs associated with credit card fraud and call center inquiries. The Duluth, Ga.-based Digital Insight, an NCR company, and the St. Petersburg, Fla.-based PSCU’s platforms integrate APIs, which allow credit card account and transaction data to flow between the two platforms in real time. Digital Insight uses PSCU's Data eXchange middleware for real-time integration. Mutual customers of Digital Insight and PSCU can offer consumers the ability to cancel a credit card permanently, report a lost or stolen card and temporarily suspend a card online using self-service tools. Consumers can also view their credit card accounts and transaction history in real time. The $1.7 billion Alexandria, Va.-based State Department Federal Credit Union has been piloting the solution since this spring. Initial reactions from the credit union and its members have been positive, according to a Digital Insight press release. "We are always listening to our members and know that integration is a key component to providing the exceptional experience they want from SDFCU. By partnering with Digital Insight and PSCU, we were able put fraud fighting card controls in the palm of our members' hands using one seamless user interface,” SDFCU Director of eStrategy and Innovation Angel Baltimore said. “Our members can now control when their cards can be used by turning them off and on, ultimately reducing fraudulent transactions over time. If by chance a card is compromised they can also report the card lost or stolen with the tap of a button. More than 120 PSCU owner credit unions use Data eXchange’s open architecture. Symitar® invited the State Department Federal Credit Union (SDFCU) to share best practices and tips at the 2015 Symitar Educational Conference & Technology Expo in San Diego, California after SDFCU completed a top-notch core conversion experience and an exemplary first-day live. Best Practices for a Flawless First-Day Live,” and “Lessons Learned: Third-Party Integration During a Core Conversion.” The sessions were well received with over 90 attendees. SDFCU completed its core conversion on September 1, 2014 migrating from Summit to Episys. A partnership with Cornerstone Advisors, Inc. was invaluable to aid in the massive project management required for the year long undertaking to convert a core processor and the project was a success, with minimal impact on SDFCU membership. “After working with SDFCU on their conversion to Episys, I thought other Credit Unions would benefit from learning about how their collaborative culture and supportive leadership contributed to their success. Jan (SDFCU CEO) was right there in the trenches—from kickoff through first-day live,” said Gretchen Holloman, Senior Project Manager at Symitar, a Jack Henry & Associates Company. Alexandria, Va. – State Department Federal Credit Union has launched new and improved interest earning products, the Advantage and Privilege checking accounts. In conjunction with this announcement, SDFCU is currently offering a cash bonus until October 31st for any person who opens a new checking account with Direct Deposit. The Advantage checking account requires a minimum balance of just $2,000 to earn dividends, while the Privilege checking account earns the highest dividend rate and the minimum balance is $25,000. Unlike many financial institutions there is no fee for falling below the minimum balance required for these. An interesting feature of these accounts is the possibility of getting ATM and Visa International Service Assessment Fees reimbursed up to a certain amount each month. “We have really been looking at ways to better the lives of our overseas traveling members and are so excited to offer a product that can help with the ISA and ATM Fees they tend to incur,” said Jan N. Roche, CEO of SDFCU. Additional, checking account information can be found by visiting the SDFCU website at wwww.sdfcu.org. As a member-owned, full service financial cooperative, State Department Federal Credit Union remains committed to serving the over 68,000 members it serves worldwide. With over 1.3 Billion in assets, SDFCU offers a full range of financial products and services that address the diverse economic and social make-up of its members. Alexandria, VA State Department Federal Credit Union recently announced new members to the SDFCU Executive Team. Jan N. Roche, President and CEO of SDFCU, announced that Floyd Matsuda has been named Chief Information Officer and Bill Thorla has been hired as Chief Operating Officer. Matsuda has been with SDFCU since 2005, most recently serving as Director of Information Technology and responsible for successfully converting a back-office IT department into a front office IT Services division. In his new role, Matsuda will remain based at the credit union’s headquarters in Alexandria, Virginia and will have an expanded responsibility for Systems and Online Delivery, Networks, and Facilities. Thorla is a new addition to the SDFCU team, bringing with him decades of experience in the financial industry. As the Chief Operating Officer, Thorla is responsible for leading the Sales and Service Division which includes Branch Operations, Member Call Center, Business Development, Marketing, and Lending Solutions. Thorla joins SDFCU from The Golden 1 Credit Union in California, where he served as Senior Vice President of Retail Delivery. 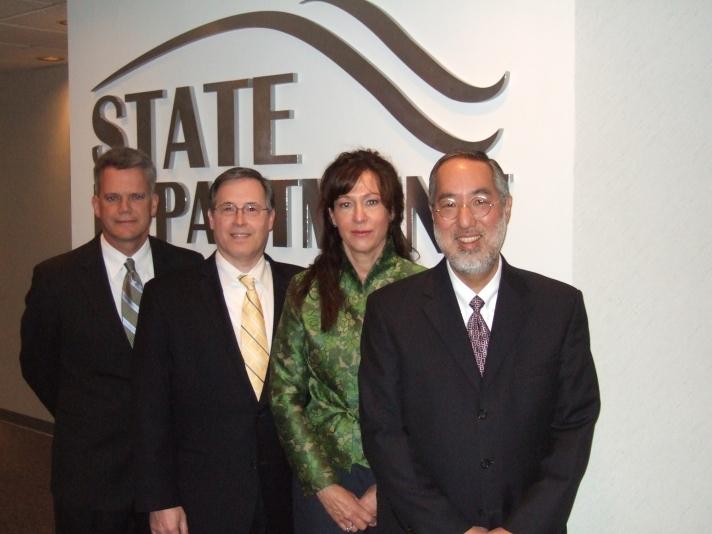 Since 1935, as a member-owned, not-for-profit financial cooperative, State Department Federal Credit Union remains committed to serving its 68,000 members worldwide. With over $1 Billion in assets, SDFCU offers a full range of financial products and services that address the diverse needs of its members. A new regulation will take effect later in 2011 that clarifies the expected duties of federal credit union directors. 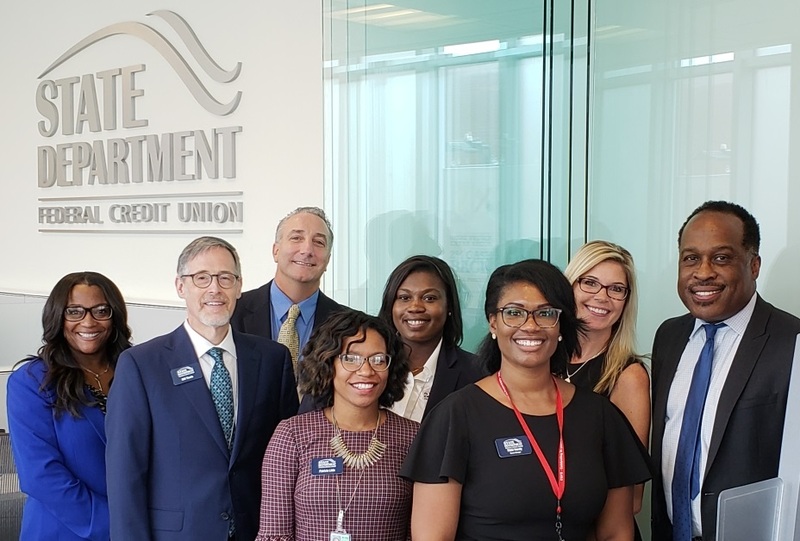 State Department Federal Credit Union (SDFCU) initiated an in-house training session for its directors, which focused on the best ways for them to fulfill their roles. On Friday, April 29, 2011, all nine members of the SDFCU Board of Directors officially graduated from Financial Skills Training as required by the National Credit Union Administration (NCUA). The SDFCU finance team partnered with Human Resources to develop a full curriculum and conduct the training. Four modules were taught over a three-month period including Statement of Condition; Statement of Income and Expenses; SDFCU Ratios; and Asset/Liability Management Ratios. “By carefully developing and designing the curriculum in-house, the information is real to us. The staff linked the content back to discussions we've had in Board meetings. We've learned about SDFCU financials, not ABC credit union” - Marlene Schwartz, Board Chairman. Participants utilized hands-on exercises to reinforce their knowledge of these important financial concepts. At the end of each session, they were tested and scored on their basic understanding of the material covered. “One of the best examples of training I've seen in brevity, tone and content” - Rich Greene, Director. “We partnered our Training experts with our Finance/ALM experts and they created a learning environment that resonated with our Board of Directors. They went beyond balance sheet basics and expanded into advanced ALM ratios. The Board is now able to better understand the monthly information presented at each ALCO meeting and ask staff more relevant questions” - Jan Roche, CEO.